This is a reliable thermocouple wire with a K-Type sensor. 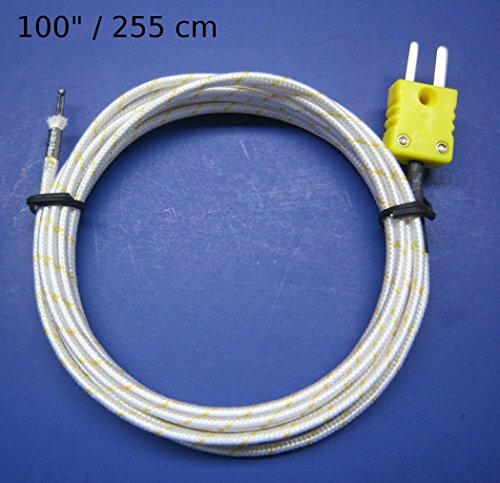 The sensor is at the tip of a extra long 100 inch (2.55 meter, 255 cm) long thermocouple wire probe, which has a high temperature fiber insulation. It has a miniature type connector that will work with digital K-type thermometers. This temperature probe can used to measure air or gas temperatures, it can be attached to pipes or embedded into objects you want to measure. Excellent to use in kiln, furnace, oven for pottery, metal working, foundry or manufacturing of metals. Many customers also use it for brick pizza and bread ovens. In kilns and furnaces it can be used to measure very hot temperatures. If you have any questions about this product by MN Measurement Instruments, contact us by completing and submitting the form below. If you are looking for a specif part number, please include it with your message.